6. The Prophet is closer to the believers than their ownselves, and his wives are their (believers') mothers (as regards respect and marriage). 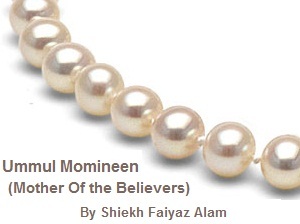 And blood relations among each other have closer personal ties in the Decree of Allah (regarding inheritance) than (the brotherhood of) the believers and the Muhajirun (emigrants from Makkah, etc. ), except that you do kindness to those brothers (when the Prophet SAW joined them in brotherhood ties). This has been written in the (Allah's Book of Divine) Decrees (AlLauh AlMahfuz)." 32. O wives of the Prophet! You are not like any other women. If you keep your duty (to Allah), then be not soft in speech, lest he in whose heart is a disease (of hypocrisy, or evil desire for adultery, etc.) should be moved with desire, but speak in an honourable manner. 33. And stay in your houses, and do not display yourselves like that of the times of ignorance, and perform As-Salat (IqamatasSalat), and give Zakat and obey Allah and His Messenger. Allah wishes only to remove ArRijs (evil deeds and sins, etc.) from you, O members of the family (of the Prophet SAW), and to purify you with a thorough purification.